Hobbits! Dragons! Weird elephants and ancient mysteries! It’s the stuff of literary and box office gold. And it turns out it’s the stuff of prehistory, too! 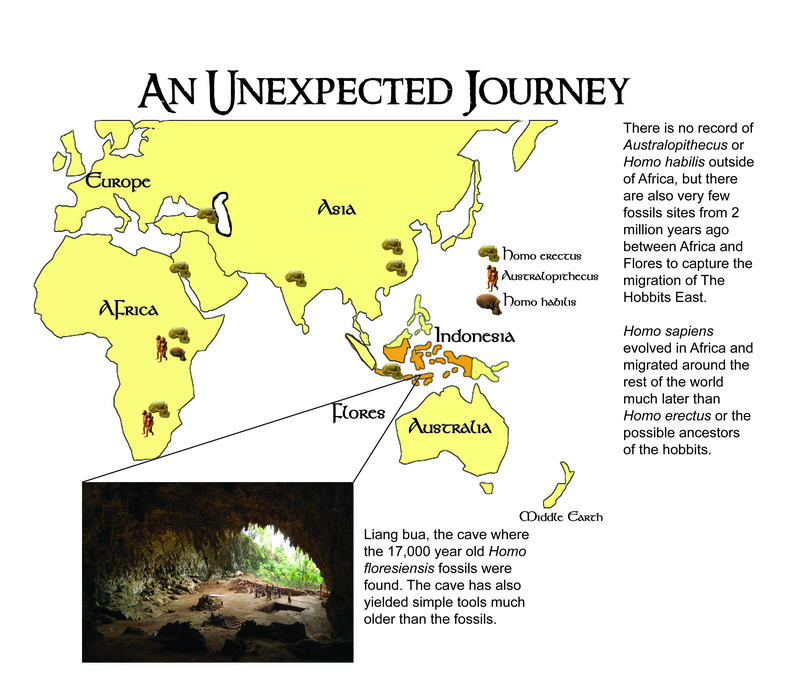 In 2004 a group of paleontologists working on the island of Flores, a part of the Indonesian archipelago, discovered the bones of small people in a cave called Liang Bua. The bones represented several individuals that were only 3’ 6” tall (A little more than a meter for the metrically inclined). Our guest this week, Dr. William Jungers from Stony Brook University and past guest Dr. Susan Larson, were invited to join the team to work on the skeleton of Homo floresiensis or “The Hobbit.” The skull of Homo floresiensis was weird, with a tiny brain and primitive features that connected the species to a more ancient species of hominin (bipedal apes) than Homo sapiens. Initial work on the fossils suggested the hobbits were small versions of Homo erectus one of the first bipedal apes to make it to Asia with large brains and tall statures. But the evidence has begun to pile up connecting Homo floresiensis to a smaller, less-brainy species called Homo habilis, a species that was never thought to have made it out of Africa. Get caught up on the state of hobbit science in this episode of Past Time and be prepared for even more fascinating discoveries to come out of Flores! The best way to listen in, is to subscribe to Past Time through iTunes. Or if you prefer, you can download the episode or stream it directly through your browser here. Don’t forget you can follow us on Twitter, where the newest member of our team, Thomas Salerno, has been reporting on the latest in paleontological and archaeological news or like us on Facebook where we will keep you updated on new episodes and the world of the past! For images, maps, and more details on the animals and people in the world of the Hobbits click below! Flores – An island in the Indonesian archipelago, sandwiched between Indonesia to the north and Australia to the south. Its closest neighbors include Komodo, Sumbawa, and Timor. At 5,200 square miles, it’s about the size of the State of Connecticut, but a little longer east to west. Homo floresiensis – Also known as the hobbits, these small hominins (bipedal apes) were discovered in 2004 and may be small because their ancestors were stuck on the island of Flores or because their ancestors were small, too! Homo erectus – A close relative of Homo sapiens, H. erectus was close to modern from the neck down, with some differences in the shoulders and legs. Their brains were relatively large. The earliest fossils of Homo erectus are from Africa or Southwestern Asia. They spread east and have been found in China and Java. Homo habilis – The earliest known species in the genus Homo. Meaning “Handy man” it was thought Homo habilis was the first tool-making hominin, though tool use may be more ancient than Homo habilis. H. habilis shared a lot of anatomical similarities with Australopithecus, one of the best-known early human relatives, including a chimp-sized brain. Biogeography – The study of the distribution of organisms in time and space. For Homo floresiensis, biogeography is especially important as the species challenges anthropologist’s understanding of human biogeography. Denisovan – A new population of human relatives that was closely related to two species of Homo: Homo sapiens and Homo neanderthalensis. Paleoanthropologists have only discovered a few bones of the Denisovans in a cave in Siberia, but one of the bones preserved enough of the genome to make comparisons to the genome of Neanderthals and humans. Like Neanderthals, whose genes are preserved in modern Europeans, Denisovan genes are preserved in modern Melanesians. Flores fauna – Hobbits shared Flores with dwarf Stegodons (relatives of modern elephants), giant monitor lizards like Komodo dragons, giant carnivorous storks, and giant rodents. Dr. William Jungers – Professor and Chairman of the Department of Anatomical Sciences at Stony Brook University on Long Island in New York. Dr. Jungers has worked on giant lemurs from Madagascar, early human evolution, and statistical methods for understanding evolution. Modern humans evolved in Africa, but Homo sapiens was not the first species of upright-apes to make it off the home continent to strike out for parts East and North. 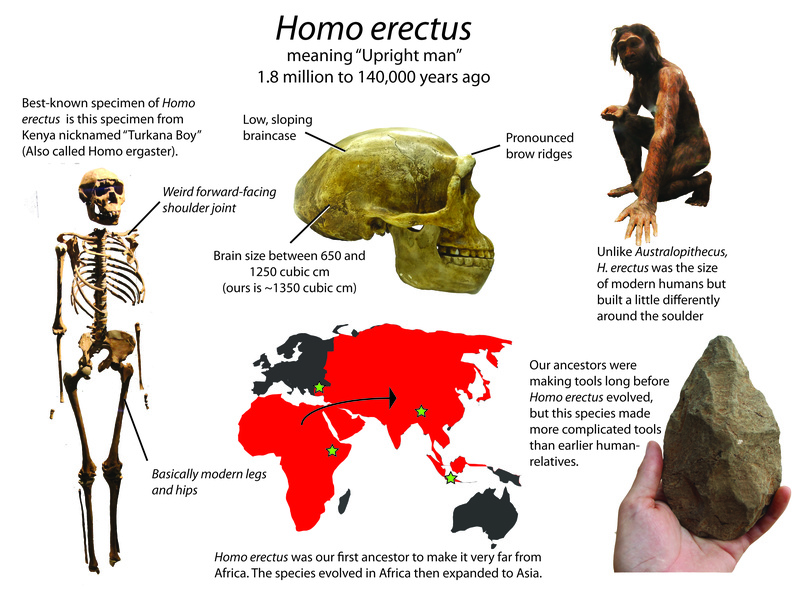 Homo erectus was thought to be the first species in our genus, Homo, to set out on the epic quest out of Africa. Homo erectus was similar in stature to modern humans, with a relatively large brain around 900 cubic centimeters. That’s smaller than our average 1200 cubic centimeter brain, but way larger than most animals. In 1891, a Dutch scientist named Eugene Dubois found the first evidence of Homo erectus in Indonesia, so the presence of the species on the islands of Southeastern Asia has been known a long time. But the newly-discovered human relative, named Homo floresiensis (meaning “Man from Flores”), wasn’t just a scaled down Homo erectus. It also had a brain half the size of Homo erectus. While body sizes change fluidly through evolutionary time, brain size tends to be pretty conservative. There are some modern human populations such as the Aka and the Efè in the rainforest of the Democratic Republic of Congo, and Negritos of Southeast Asia that have relatively small bodies that may be adaptive to resource-poor forests, islands, or adaptations to high heat and humidity found in tropical environments. But all of these small-statured people have completely modern brains with a volume comparable to any other individual in the species Homo sapiens. Dr. Susan Larson (guest in Episode 5) and Dr. William Jungers (Episode 10’s guest), the co-describers of the skeleton of Homo floresiensis. After the initial discovery of Homo floresiensis was announced, the original team searched for other experts who could help them answer some of the questions posed by the existence of The Hobbit. They brought in Dr. Susan Larson and Dr. William Jungers to work on the skeletal material that was found in the cave. 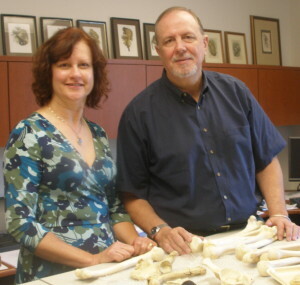 These two professors from the Department of Anatomical Sciences at Stony Brook University had worked with other human fossils and as they started making comparisons to Homo erectus, they noticed several features – relatively long limbs, short, muscular legs, long feet, weird shoulder placement – that the hobbit had that were not part of Homo erectus anatomy. But, when they reached further back in time, they noticed more ancient relatives of humans, like the 2 million year old Homo habilis, had skeletons very similar to Homo floresiensis. Homo habilis and closely related species from the genus Australopithecus had chimpanzee-sized brains, made very simple tools like the tools found in the caves with the hobbits, and had limb proportions like the hobbits. 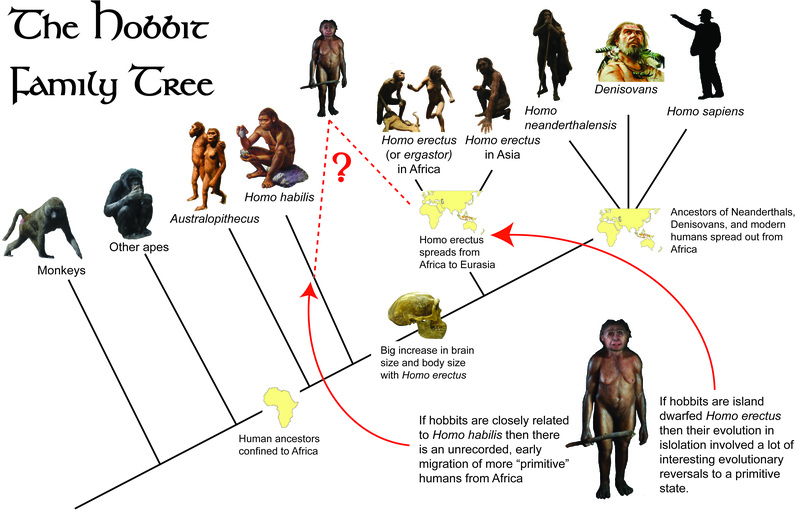 Maybe the hobbits were relatives of Homo habilis instead of Homo erectus! But – and there is always a but – this was a much more radical idea than rearranging the brain of Homo erectus on and island. The fossils of Homo floresiensis are about 17,000 years old. They were already a relict if they were related to Homo erectus which went extinct in most places more than 100,000 years ago and may, just may, have persisted in Southeast Asia up to 35,000 years ago. But Homo habilis went extinct in Africa about 1.4 million years ago and there is no evidence of the species outside of Africa. If Homo floresiensis is closely related to Homo habilis then where is the evidence of this great migration out of Africa and into Southeast Asia? We have remains of Homo erectus in Georgia (the country), India, Indonesia, and China, why not Homo habilis? The answer may be pretty simple: We haven’t found it yet, and Flores is just the first clue. In recent years, the story of our closest relatives such as Neanderthals has become pretty complicated with evidence of genetic mixing between Homo neanderthalensis and Homo sapiens and the discovery of an ancient population of humans, called the Denisovans, that was genetically distinct from Neanderthals and Modern humans but interbred occasionally with both species. When and how humans migrated out of Africa is complicated, maybe we should have expected the entire story of hominin migrations to be even more difficult to unravel. Beyond the mystery of the origins of the hobbit, there is the problem of how this diminutive species even made it onto the island of Flores. Deep waters surround the island, and even during glacial periods when a lot of water was wrapped up in ice at the poles, there was still deep water around Flores. How did these people with their small brains and simple tools get across the water? The oldest boats are younger than the first sign of the hobbits on Flores. Regardless of how they got there and where they came from, we know life could not have been very relaxing on this tropical island. The mountainous island was populated with large predatory birds, including giant owls, and six-foot-tall carnivorous storks closely related to the vulture-like Marabou storks of sub-Saharan Africa and even larger predatory lizards like the Komodo dragon and Varanus hoojieri a monitor lizard with rounded, crushing teeth. Dr. Jungers and the rest of the Liang Bua excavation team know that the hobbits were also predators in this ecosystem, hunting and butchering the small elephant relative Stegodon floresensis and giant rodents. 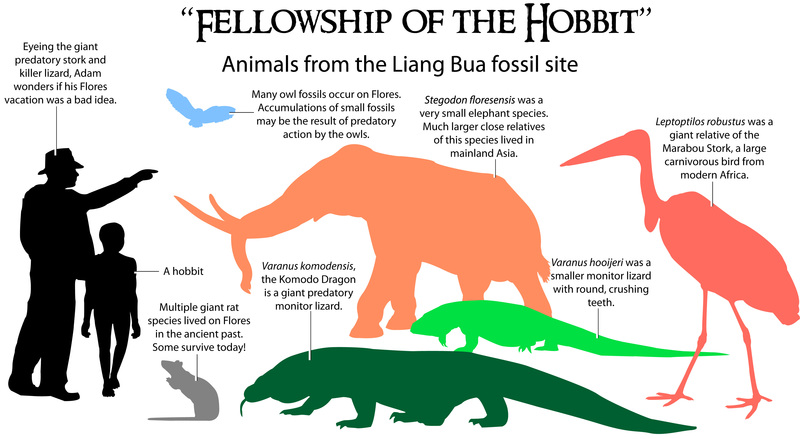 Paleontologists have learned a lot about the anatomy and habits of the hobbits, but in some ways it feels like the discovery has only raised more questions: How did early humans disperse through Southeast Asia? When did they disperse? Who were they related to? Fortunately, the questions are still driving plenty of research in the world of the hobbits. The quest is not finished. For more information on the dispersal of modern humans out of Africa check out National Geographic’s Genographic Project. For more on the history of the discovery and controversy surrounding the discovery of Homo floresiensis, check out Dean Falk’s The Fossil Chronicles: How two controversial discoveries changed our view of human evolution. Falk gets into more of the anatomical detail and the personalities that gravitate towards human evolution research. For a deeper dive into the origins of humans, try Ian Tattersall’s Masters of the Planet: The Search for Our Human Origins. An introduction to the cast of early human characters including Australopithecus, and growing diversity of Homo. For a more technical discussion of human origins and human migration in a more textbook-like form, check out The Human Career: Human biological and cultural origins by Richard G. Klein. In this well-illustrated tome, you will learn the details of the hominin family tree and details about both the human paleontological and archaeological record. Falk, Dean, Charles Hildebolt, Kirk Smith, M. J. Morwood, Thomas Sutikna, Pter Brown, Jatmiko, and E. Wayhu Saptomo. 2005. 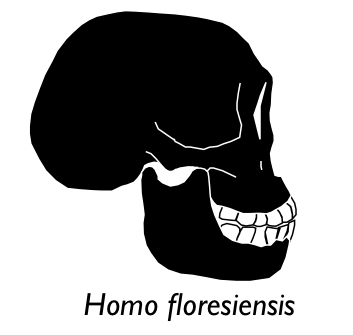 The brain of LB1, Homo floresiensis. Science 308: 242-245. Jungers, William, J., W. E. H. Harcourt-Smith, R. E. Wunderlich, M. W. Tocheri, S. G. Larson, T. Sutikna, Rhokus Awe Due, and M. J. Morwood. 2009. The foot of Homo floresiensis. Nature 459: 81-84. Larson, Susan G., William L. Jungers, M. W. Tocheri, C. M. Orr, M. J. Morwood, T. Sutikna, Rokhus Due Awe, and T. Djubiantono. 2009. Descriptions of the upper limb skeleton of Homo floresiensis. Journal of Human Evolution 57: 555-570. Aiello, Leslie C. 2010. Five years of Homo floresiensis. American Journal of Phyical Anthropology 142: 167-179. Meijer, Hanneke J. M., Lars W. van den Hoek Ostende, Gert D. van den Bergh, John de Vos. 2010. 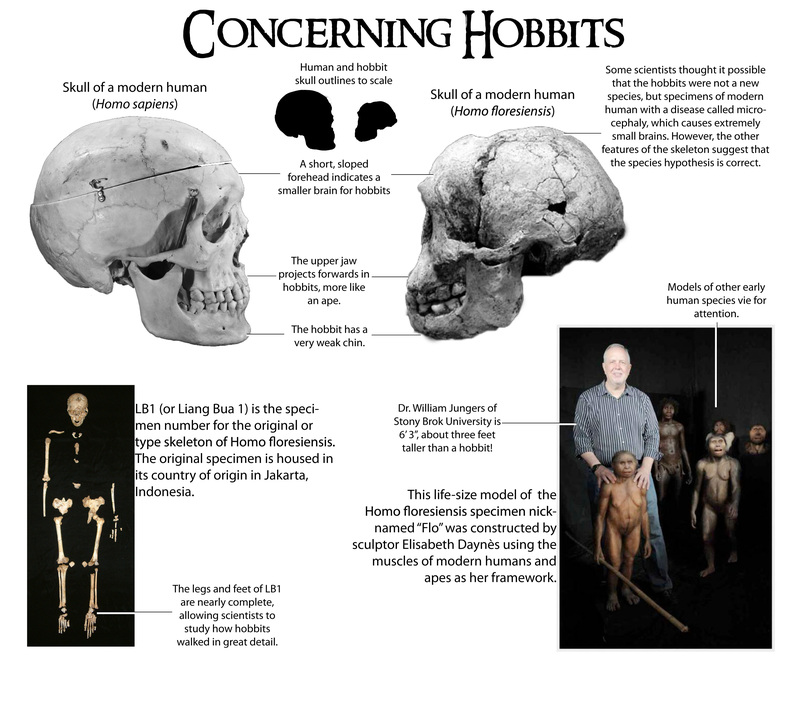 The fellowship of the hobbit: The fauna surrounding Homo floresiensis. Journal of Biogeography 37: 995-1006. Hi I stumbled over this blog while looking for reconstructions of denisovans. The picture you’ve used in the family tree shows a Neandersthaler not a Denisovian otherwise a great article! Thanks for the comment Phil! I think we chose to use that rendering as essentially a placeholder, seeing as the true appearance of Denisovans remains a mystery. Still, it’s a good caveat to have for this post.